← I’m a Lambda Literary Award Winner! Wow. I’ve always been a huge fan of author Ray Bradbury (Something Wicked This Way Comes, Fahrenheit 451, etc). He writes some of the most poetic verse you’ll ever read. Many times, I love individual paragraphs or sentences of his books more than I do the novels as a whole. Plus, he has written some of the most fantastic short stories ever. Years ago, I was reading a story of his that was simply a conversation between a man and his son, and as I continued reading, I soon realized that the cryptic conversation the two were having was actually a discussion about the son being gay! Yet the word was never used, because it was about the emotions humans were experiencing rather than a focus on the concept of “gay.” Amazing. 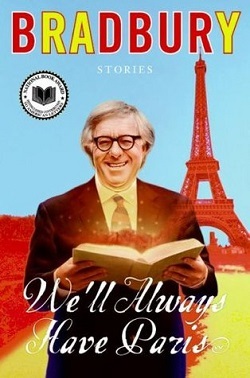 In the foreword of one of his more recent short story collections, entitled We’ll Always Have Paris, Bradbury says that many of his stories are based on true experiences he has had. Imagine my surprise when I read the story that gives the book its name: “We’ll Always Have Paris.” Why was I surprised? Because the story, written in first person, which makes it hard not to take it as some sort of autobiographical piece, is about a protagonist who leaves his wife in their room while in France and nearly gets some action from a guy who cruises him on the streets of Paris!!! WTF??? Not something I’d ever expect from Bradbury. It’s beautifully told with a combination of honesty, compassion, and innocent naivety, whether or not it’s based on a true man-on-man flirtation or fully fictional. This entry was posted in Everyday I Read the Book: Literary Thoughts, Johnny You ARE Queer - Gay Thoughts and tagged gay horror, Ray Bradbury. Bookmark the permalink.